Investigation has been ongoing now for years as scientists have tried to determine whether stem cells from adult tissues have the same capabilities and potential as embryonic stem cells. Studies are constantly revealing new information and it is hoped that therapeutic applications will be developed from both sources. The question, however, perhaps remains: which source holds the advantage? Adult stem cells are usually less flexible and versatile than embryonic stem cells. Embryonic stem cells have a far greater differentiation potential than adult stem cells simply because embryonic stem cells can develop into almost every type of cell in the human body. Conversely, adult stem cells may only develop into a limited number of cell types, so their potential applications are not as great as embryonic stem cells. Newer studies do, however, propose that adult stem cells may have greater plasticity than was originally thought, which means that they may be able to differentiate into a greater range of specialized cell types. At present, however, it would appear that embryonic stem cells still have the advantage in their ability to differentiate more readily than adult stem cells. In the case of stem cells, the answer is yes, presumptuous that more stem cells still means viable, high quality ones. Embryonic stem cells are capable of almost unlimited division, or proliferation, when placed in a culture whereas adult stem cells do not multiply so readily. The difficulty level varies as well; embryonic stem cells can be grown fairly easily in the laboratory whereas adult stem cells are not easily grown after isolation from mature adult tissues. Stem cell replacement therapies require large numbers of cells and the current difficulty in growing large numbers of adult cells means that their use for therapy at present is limited. Notwithstanding the ethical issues, embryonic stem cells show an overwhelmingly higher potential to treat disease. However, research should still continue with adult stem cells. It is possible that researchers will discover ways to develop adult stem cells with more success as well as find ways to improve how they function once transplanted into the human body. Recent evidence indicating that adult stem cells may have more potential than was previously thought means that adult stem cells should continue to be researched alongside embryonic stem cells. Ultimately, it's a case where both stem cell sources can be valuable to prolonging and saving human life. 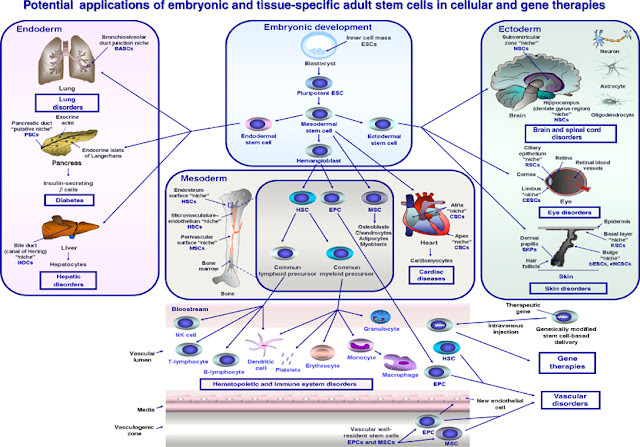 Scheme showing the potential therapeutic applications of embryonic and tissue-specific adult stem cells in cellular and gene therapies. The pluripotent ESC types derived from blastocyst stage during embryonic development and multipotent tissue-resident adult stem cells arising from endodermal, mesodermal, and ectodermal germ layers are shown. The pathological disorders and diseases that might benefit the embryonic and tissue-resident adult stem cell-based therapies are indicated. 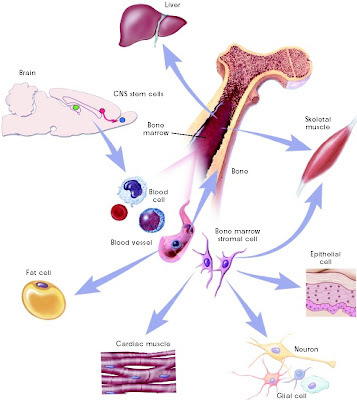 Abbreviations: BASCs, bronchioalveolar stem cells; bESCs, bulge epithelial stem cells; CESCs, corneal epithelial stem cells; CSCs, cardiac stem cells; eNCSCs, epidermal neural crest stem cells; ESCs, embryonic stem cells; EPC, endothelial progenitor cell; HOCs, hepatic oval cells; HSCs, hematopoetic stem cells; KSCs, keratinocyte stem cells; MSCs, mesenchymal stem cells; NSCs, neuronal stem cells; PSCs, pancreatic stem cells; RSCs, retinal stem cells; SKPs, skin-derived precursors.